So on to one of her desserts of the day. 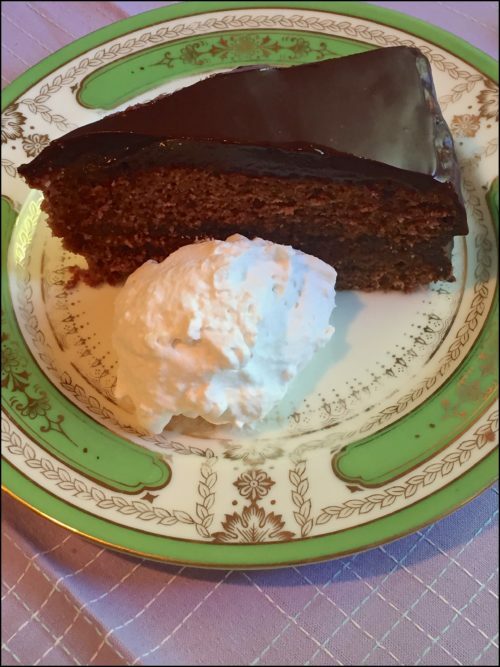 I’ve heard of sacher torte for years but never made it. 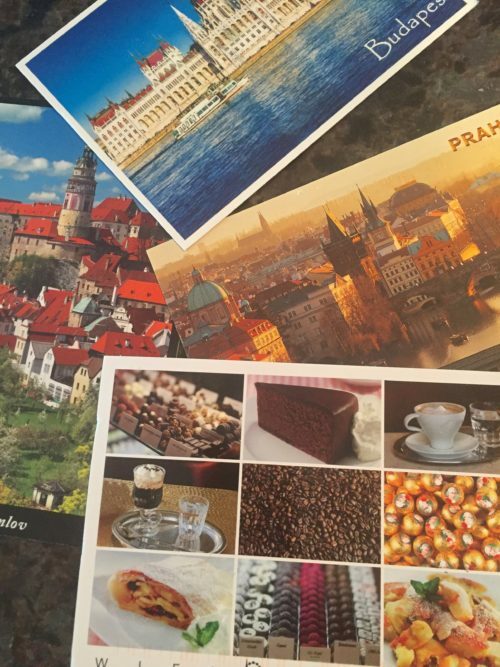 But after getting a post card from Janet with this dessert and the picture of her and her granddaughter Sara eating it. 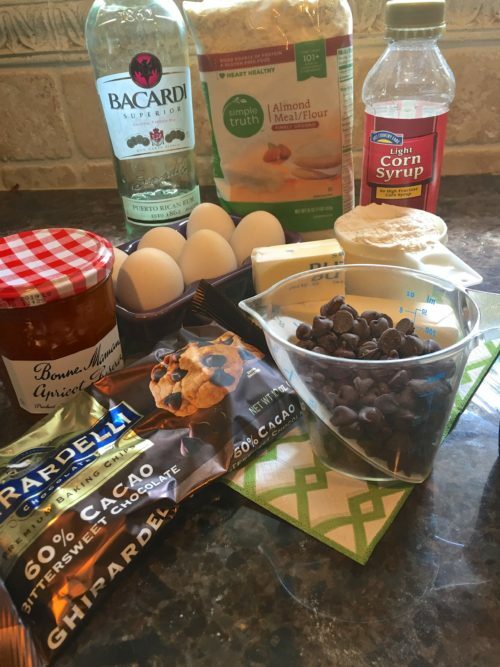 I knew I had to make it and what better reason than another dessert to take to a bunch of ladies who love to try the things I make — good or bad. Usually I don’t take the “flops”, they go in the trash. My disappoint in the finished product was that it’s a dense cake. 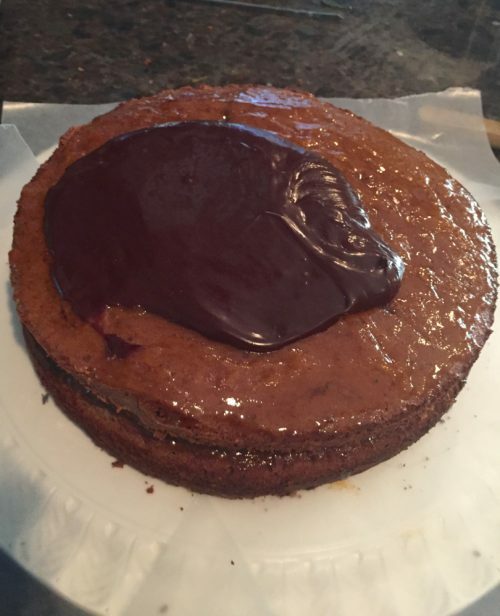 I used one of Lidia C recipes and wasn’t satisfied with the way she did her ganache. 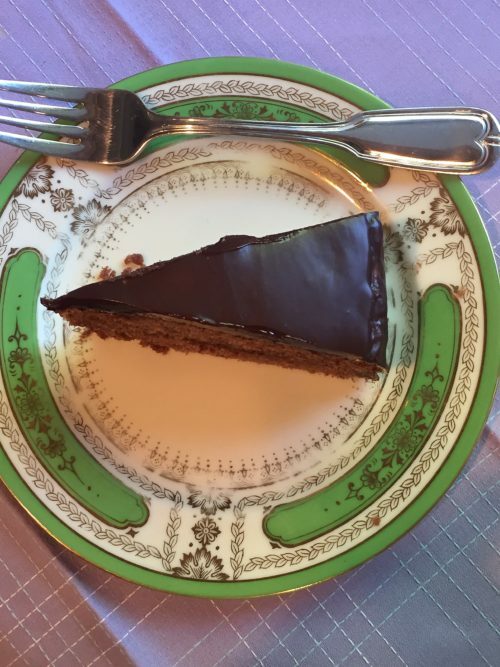 Normally ganache is just cream and chocolate; she added white Karo syrup to the ganache and she also used some almond flour with her cake. I will definitely make this again but will try a different recipe. BLAST FROM THE PAST: Looking for a new side dish for summer cookouts? Try my Cuban Style Brown Rice and Black Beans. 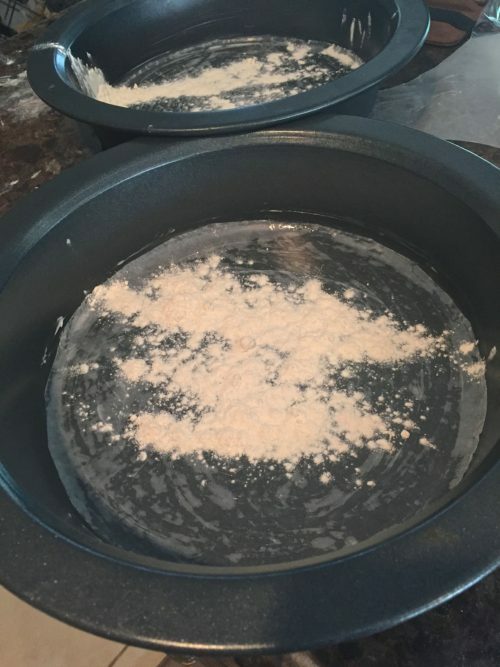 Grease bottom of pans, add wax paper circles, then grease and flour. Shake out excess flour. 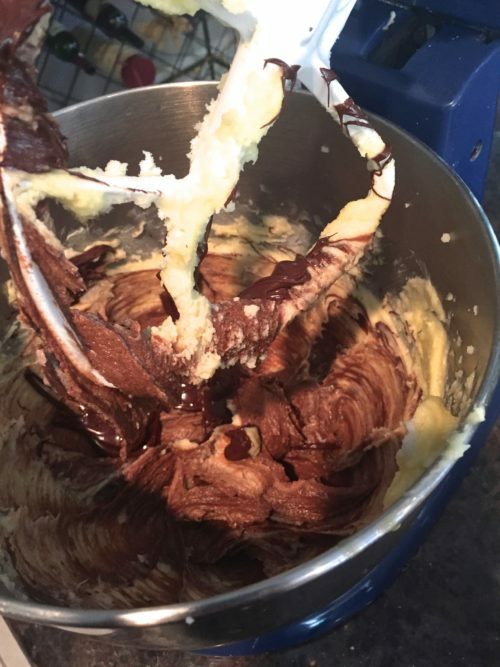 Beat the butter and sugar then add in the yolks one at a time and after mixing, stir in the melted chocolate. Beat in 1/4 of the egg whites then hand fold in the remainder of beaten whites. I use these baking strips. You wet them and fasten around pan with a “t” pin. 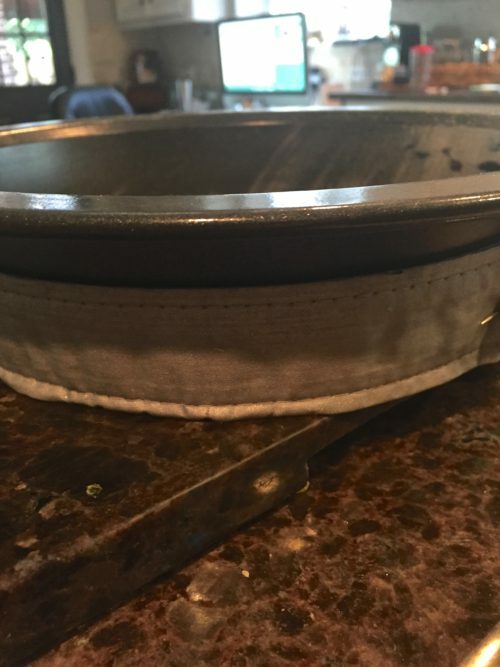 These strips keep the tops of the cake layers flat and not domed. 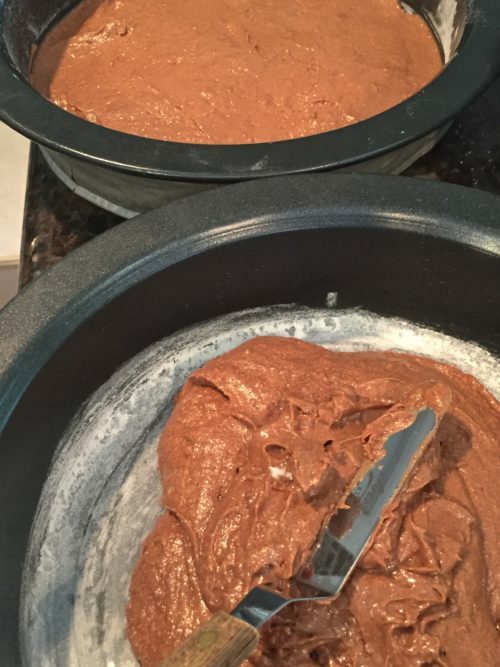 Divide the batter between the two greased and floured pans and spread to edges of pans. Put the first layer down and spread about 1/2 cup of the apricot preserves over the later. Then add the top layer and brush with some of the apricot mixture. Make the ganache and spoon over the cake to smooth top and sides. Yum, now whip your heavy cream. 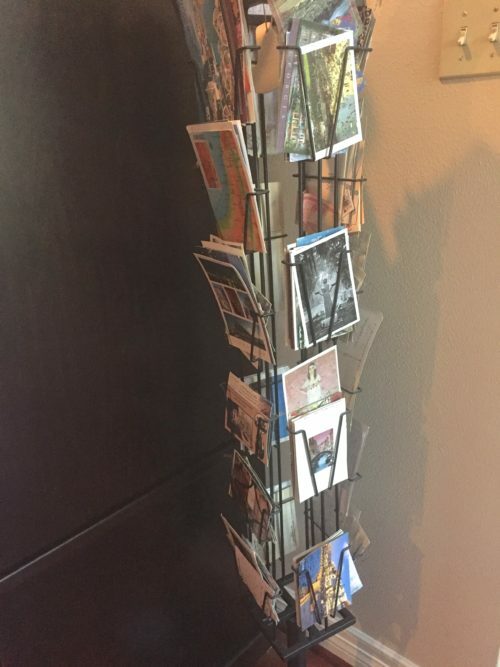 This is my post card rack where I have put hundreds of cards from friends and postcards I even send to myself. My little “bird girl” I have this statue in my garden and also a smaller one on my mantle. 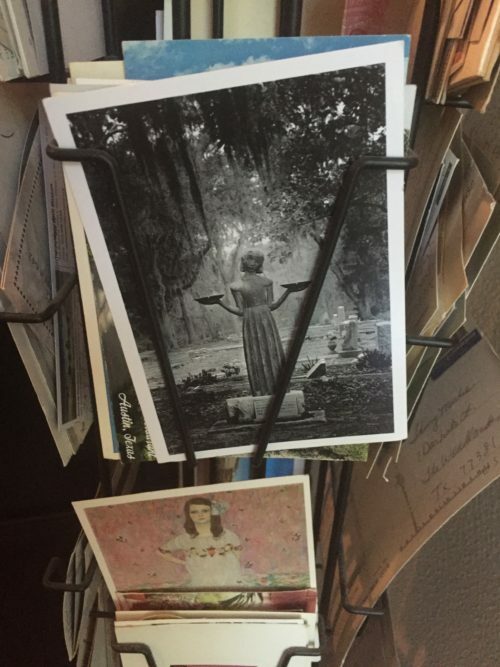 I did send this one to myself after a girl’s trip to Savannah last year. 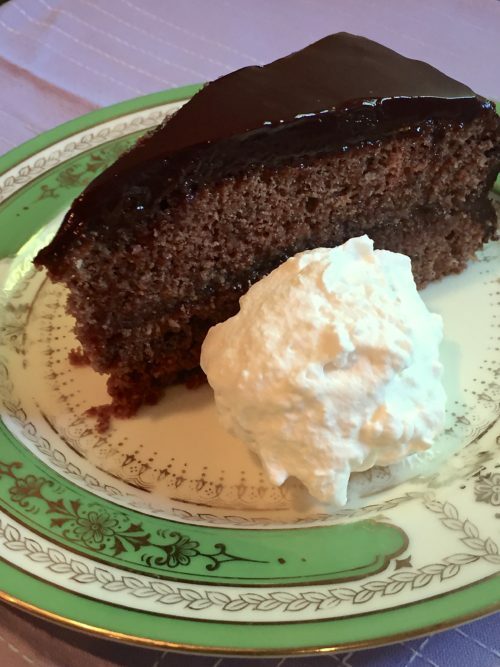 Dense chocolate cake with apricot preserves. Preheat the oven to 375°. Butter a 9-inch springform pan. * Line the bottom of the pan with waxed paper and butter the paper. Dust the pan with flour, tapping out the excess. 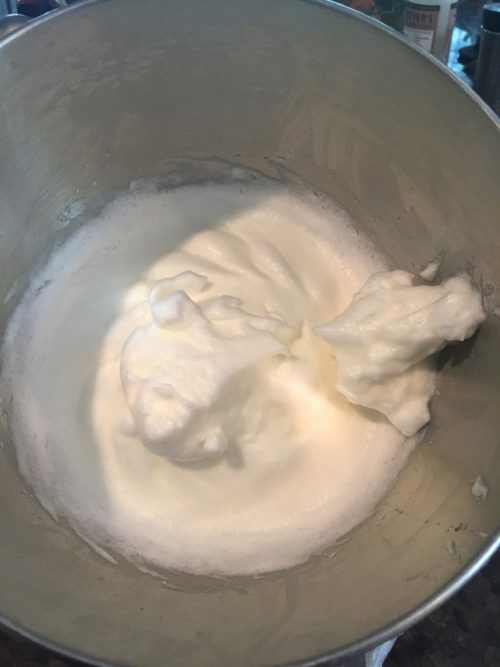 ctric mixer, whip the egg whites at high speed until soft peaks form. Scrape the batter into the prepared pan(s) and smooth the top. Bake the cake in the center of the oven for 35 to 40 minutes, until a toothpick inserted in the center comes out with a few moist crumbs attached. Let the cake cool on a wire rack for 30 minutes, then remove the ring and let the cake cool completely. Invert the cake onto a plate and peel off the parchment. Turn the cake right side up. Using a long serrated knife, cut the cake horizontally into 3 even layers. The torte can be covered and refrigerated for up to 2 days. I did not want to bake in springform pan and chose to bake in two 9" cake pans so I would not have to cut. Cooked faster than suggested since it was in two pans and I would also use 8" pans the next time. She add almond flour with the all purpose. 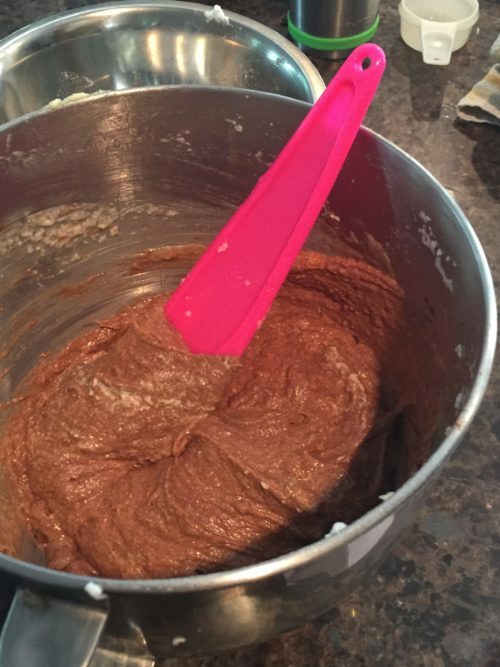 I would to add almond flour the next time, maybe either use all all purpose or look at another recipe. Most recipes I have looked at only call for making two layers.